If you’re an introvert, look away now. Nothing to see here. 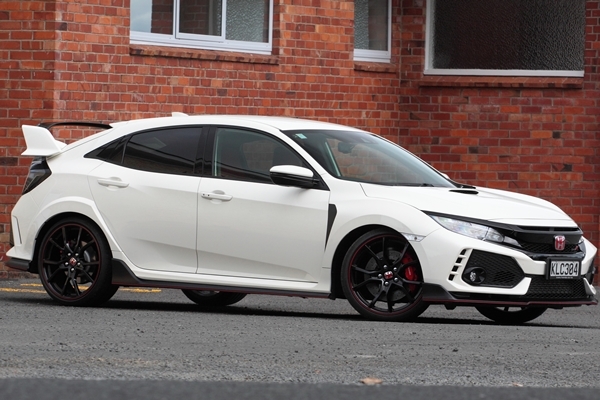 This Honda Civic Type R isn’t for you; it’s about as subtle as a plane crash. This potent sedan has got more wings and fins than your local Chinese takeaway, yet Honda reckons that they’re all functional. Sure, aerodynamics would come into play if you’re hot-lapping the famous Nurburgring, which this Civic Type R has done, and set the lap record for fastest production front-drive car while it was at it. But when you’re popping down the corner store for a paper and a bottle of milk the benefits are questionable. And, that’s one of the car’s strengths. It will happily pootle around all day, with no rough idle, heavy clutch action or bone jarring ride. Then when you want to get busy, the Type R is instantly up to the task. Being so user-friendly, it makes the driver look good in the process. Type R is seriously good fun. The 2.0L DOHC i-VTEC turbocharged engine cranks out 228kW at 6500rpm and 400Nm of torque between 2500 and 4500rpm. There’s no turbo lag, and it will spin out to its 7000 rpm redline quicker than you can scream ‘oh my god’. This delightful engine is backed by a six-speed a manual gearbox that has an impressively precise, mechanical feel to the gearshift, and an old-school round shift knob. The engine management has a ‘rev match control system’. When the driver downshifts, the engine automatically gives a bit of a rev between the gears, just like a skilled driver would when heel and toe-ing. It sounds way cool, as does the cackle through the exhaust on a trailing throttle. The exhaust system is worth making a noise about. Notice the three exhaust outlets under the rear bumper? This isn’t a styling gimmick, it’s like that for a reason. The outer pipes are the main exhaust outlets, while the middle pipe feeds off a resonator. At low to medium engine revs speeds, all three outlets are working. At high rpms the resonator is bypassed for an unobtrusive exhaust note at cruising speeds. In the real world, Civic Type R sounds the part under hard acceleration, but unfortunately it’s too tame the rest of the time. Thankfully that’s the only thing that’s tame. Type R’s already rigid body shell has increased stiffness thanks to the use of additional adhesive in key areas. Compared to the previous Type R, torsional rigidity is up by 38 per cent. Couple this with revised front suspension geometry, high rigidity rear suspension arms and springs and anti-roll bars which are ridiculously stiffer than a stock Civic’s, and you have superb handling and road holding. Surprisingly, ride is firm, not bone jarringly harsh as you’d expect. There are three driving modes, compared to the previous Type R’s two. A new ‘Comfort’ setting sits alongside ‘Sport’ and the track-focused ‘+R’ modes. Each mode tailors the adaptive dampers, steering force, gear shift feel and throttle response to the desired driving style. While Comfort is, well, comfortable, if you’re going to ponce around all day in Normal mode you really don’t deserve this car. Sport is fine and dandy for pretty much everything, except when you want to get really mental with it. Then you choose +R which basically engages beast mode. Yahoo! Honda has also done a superb job of dumping all that power through the front wheels only. Torque steer only rears its ugly head under full throttle in +R mode. 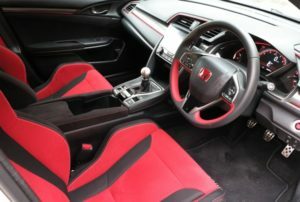 You can have your new Type R in one of four colours, unlike the interior; that’s only available in black with red seat facings and trim highlights. Subdued it ain’t, but it’s definitely comfortable and the sports seats are first rate. Civic Type R retails for a hundred bucks under $60k. That’s close to Subaru WRX STi; power and torque figures are all but the same, but the Sub has all-wheel drive. And, you can delete the STi’s rear spoiler, which is something you’ll wish you could do with the Type R if the comments we heard during our road test were anything to go by.